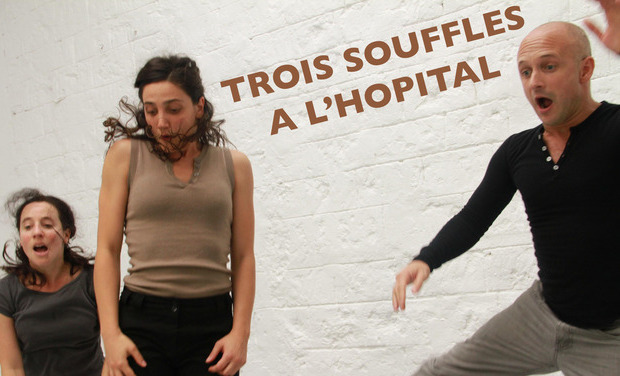 Your support will enable us to conduct a one week residency for our choreographic project TROIS SOUFFLES (Three Breaths) at the Charles Richet Hospital in the Val d'Oise, FRANCE and a public performance in the theater of the Charles Richet Hospital. The residency will include rehearsals and a performance open to the patients, their families, and the personnel of the hospital. This project will prolong and enrich a series of 20 dance workshops that we are conducting with a group of patients from the Geriatric Division of Charles Richet Hospital. This cultural outreach project started in November 2012 at the Charles Richet Hospital (Val d'Oise, FRANCE), the program integrates artistic practice, discussion, and exchange. The central part of the project is the workshops given to the long term residents of the UHPAD - Live-in unit for older dependent patients and the ULSD - Unit for long term medically assisted patients - at the Charles Richet Hospital in Villiers-le-Bel, FRANCE. These patients are heavily dependent and suffer from different pathologies, both physical and psychological (such as Alzheimer disease, and senile dementia). With the support and co-financing of the Charles Richet Hospital, the DRAC Ile de France and the ARS- Agence Régionale de Santé, we are able to offer workshops for 12 patients that integrate breathing exercises and movement explorations, using the musicality and the micro-movements connected to the breath in resonance with our our choreographic process. In our choreography we use breath as the basis for the movement material, and more precisely in TROIS SOUFFLES we use the breath line of three different famous choreographers as an inventive way of creating new choreographic material. (We will elaborate on this project further on). We invite the patients to experience their body as living matter and source of creative inspiration by exploring the respiratory volumes in the body and mobilizing the body through imaginary paths of breath. These exercises awaken the imagination, the senses, all the while creating a global sensation of well being and relaxation. In addition to these weekly workshops, we show the patients videos of contemporary dance, as well as videos of our other choreographic works, and we host informal dance performances in the hallways and their rooms. ... or geometric mountain ranges with clear graphic lines drawn from a duet from Mammame by Jean-Claude Gallotta (1985) in which the breath is a resounding and percussive soundscape, punctuated by noises and onomatopes. The collaboration of Christina Towle and Laurence Pagés grew from common desire to use respiratory movement as their choreographic focal. TROIS SOUFFLES reduces dance to an essential element: breath. This movement choice creates a dance that emanates and projects from the torso, sparked by subtle accents, and with an elastic movement quality. Four dancers accept the challenge to construct a dance from strict breath indications, obliging them to adopt the breath of someone else, in a process which engages them in a visceral dialogue with one another and the audience. Laurence Pagés and Christina Towle met during the training program for young choreographers entitled TRANSFORME, directed by Myriam Gourfink at the Abbey of Royaumont. As a part of this workshop, they conceived a way of writing breath scores. 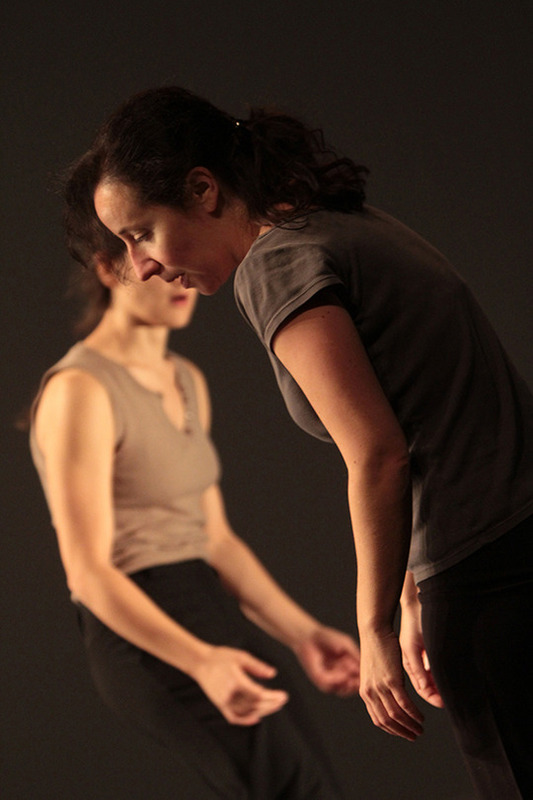 Over the next two years, they pursued this research topic and perfected their method of writing, as well as collaborating on the choreography of two solo's: Corps de Luttes (Fighting Body), on the theme of apnea created by Laurence Pagés in 2009, and Airtight, on the relationship between breath and gravity, created by Christina Towle in 2011. With the creation of TROIS SOUFFLES, Laurence Pagés and Christina Towle are continuing to enrich their choreographic process that began in 2008. 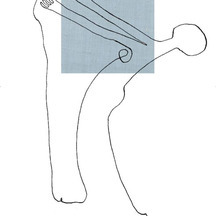 A very specific movement preparation is given to the dancers in order to install a deep connection with their breath, awakening the subtle inner dynamics of the body. This preparation is a hybrid of techniques inspired by vocal exercises, yoga, and contemporary dance which open the respiratory volumes in the body and heightens the sensation of porosity on the surface of the body; creating a body that is sponge-like. A dance piece in which their are two choreographers is an unusual situation. What makes this particular equilibrium work is due to many factors: a long period of maturation of the project in which the team has had the chance to deepen their collaboration; a strong motivation to bring this project to fruition, and on a more personal level, and each for different reasons, as a personal necessity pursue a choreographic partnership. Through the hypnotizing sound of the breath, which serves as both the choreographic line and the sound score for TROIS SOUFFLES, the audience is invited to adopt the dancers breathing patterns. The omnipresent respiratory action creates a very strong empathy between the public and the dancers, the space breathes, provoking sensations that can span from anguish to relaxation, either having their breath taken away or being given a breath of fresh air! 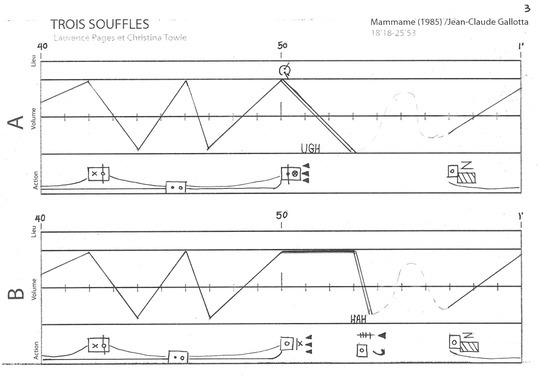 In TROIS SOUFFLES, the dancers incarnate, as a stratagem for constructing new dances, the breathing patterns observed in three existing choreographies: a solo of Kazou Ohno Hommage à la Argentina (1977); a solo of Odile Duboc O.D.I.L. (2006), a duo from Mammame of Jean-Claude Gallotta (1985). For the dancers, they must confront themselves with the breath of someone else. Dancing in the respiratory pattern of another's choreography in not an easy task. It is also a fantom-like way of inhabiting the dance and even the spirit of someone else. The invention of the breath scores unearths respiratory patterns that support and structure dances of radically different dynamics and colors: an inhibited breath, with an irregularity that creates tension in the body a dance with ripe apneas that give way to falls and recovery with sudden and subtle dynamic changes and an agitated and percussive body in a dance punctuated with onomatopes and impacts. From this palette of rich movement qualities, we evoke the different body states that breath can induce. The breathing patterns, itself imbibed with meaning, creates strong relationships between the dancers and incites striking and original situations with strong emotions. TROIS SOUFFLES is a formal game that mirrors the propositions of Oulipo, or the project of George Perec in "The Disparition", where he plays with writing a story without the letter "e". Here, the game is the citation of an informal element, almost invisible, from an original choreography. We extract or extrapolate an element from it's original context and look at it through a magnifying glass, in order to hone in on a particular "detail", in the sense that Daniel Arasse gives the term, seeing the original choreography through an intentionally grotesque or "exaggerated" prism. This project opens a discussion that is both artistic and political about heritage, the contemporary usage of tradition, and the place that we give to referential figures (works, masters, historical figures). In TROIS SOUFFLES, heritage is seen as creative material, and is passed on through its diversion, transformation, and re-appropriation. 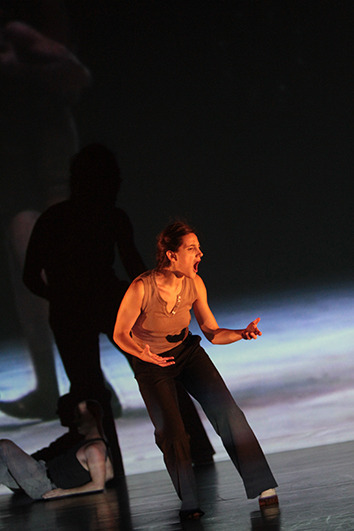 The re-interpretation of the breath scores creates a dance quite different from the original dances, in the movement choices as well as in the theatrical choices. However, almost in spite of ourselves, there is something of the spirit of the original work that subsists even though the formal aspects of the dance are radically different. This phenomenon proves that breath is a essential and fundamental element in a choreographers signature and a defining factor in movement quality. Breath in TROIS SOUFFLES is sculpted, kneaded, and twisted. A material like the wood of the cabinet maker, the glaze of the ceramist, the glass of the glass-blower…the material of the artisan. The challenge of this project is to make the breath visible in the dance, to give it the main role and to make it the hero of our story. Through the lecture and the interpretation of the breath scores the dancers develop a particular attention to the musicality and the micro-movements associated with respiratory movement. An agility and sensitivity to it's flow makes for a sponge-like body: muscle tissues become elastic and color the dance with qualities of resistance and suppleness. The body molds itself from the inside while keeping a fine attention to the breath line and to the other dancers. TROIS SOUFFLES has received the precious support of the ARS/DRAC Ile-de-France and the Hospital in order to fund the workshops with the patients of the Charles Richet Hospital. But, unfortunately this is not enough to finalize our initial project in which we hoped to reach the patients not only through workshops but also through our presence, as artists, through rehearsals and a public performance of our choreographic creation, really integrating the creative process within the daily life of the hospital. The funds raised through KissKissBankBank will allow us to have one week of rehearsal for the creation TROIS SOUFFLES in the theater, which is in the center of the Villiage of the Charles Richet Hospital. - the creation and impression of a booklet in 50 copies, created from the impressions of the patients and photos taken during the workshops and if possible, during the public performance with the patients and their family. This booklet, offered to the patients, to their family and to the nurses, will allow them to keep a written and visual memory of our choreographic adventure !